WASHINGTON (CNS) — Following a conversation involving a border bishop and Catholic leaders, migrant advocates from around the U.S. got behind a July 18 pastoral letter issued by the bishop of the Diocese of El Paso calling for a stop to militarization along the border with Mexico and showing compassion for migrants. Though the letter was addressed to his diocese, it also is addressed “in a special way to our migrant community who are living in a great deal of fear right now, who need to hear that they are not alone, that God is with them, that he can change those dry sands into springs and pools of water and that God can also invite us into union with each other,” said the bishop in a July 18 video conference from Texas. “Bishop Seitz’s pledge to the people of the Diocese of El Paso to stand with those experiencing anxiety and fear as a result of our country’s broken immigration system may seem simple, but it speaks volumes about where the church stands at this key time for our nation — squarely with the marginalized,” said Christopher Kerr, executive director at the Ohio-based Ignatian Solidarity Network, one of the participating organizations. During the conversation, Bishop Seitz made a passionate plea for others to understand the real danger that prompts migrants to leave their native lands. He spoke of a parishioner in his diocese in his 30s, a husband and father of two, who had been a successful businessman in his native Mexico until narcotraffickers began extorting money from him. The diocese also is asking attorneys to develop a memorandum to instruct pastors on their rights “if immigration officials should come seeking to do some kind of enforcement action at their parish,” he said. Bishop Seitz said that at the beginning of September, bishops from dioceses surrounding the entire 2,000 miles of U.S.-Mexico border, on both sides, will meet in Piedras Negras, Mexico, which is southwest of San Antonio. “Obviously, it’s a very significant time for us to be talking about life on the border and the impact of various enforcement actions,” he said. 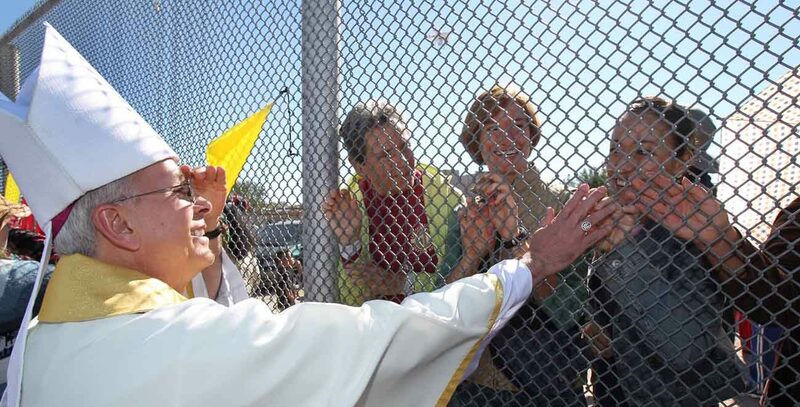 She reinforced the Bishop Seitz’s call to immediately end deportations and detentions until comprehensive immigration reform can come to fruition. The institute supported Bishop Seitz “for backing strong community action to push back on a broken immigration system and for his strong message of solidarity with the migrant community in this time of fear,” Corbett said in an email to CNS.